Setting up a website from scratch can be a scary process. From registering the domain name to getting the site design right, to setting up and testing every page of the site, the number of things on that to-do list are endless. This can be even more complicated when the site you’re setting up is an ecommerce one. Multiple products equal multiple opportunities for mayhem. This is where Shopify comes in. With its zippy user interface, thousands of mind blowing templates and step by step product support, Shopify is a forerunner among ecommerce CMS platforms. One of the key things that makes Shopify such a fan favorite is the fact that it gives you a leg up with SEO right from the get go. A whole bunch of SEO must-haves come straight out of the box, including automatically generated sitemap.xml and robots.txt files, automatic canonical URL tags, the ability to edit alt tags, file names for images, page titles, H1 tags, and more. While I could drone on about SEO basics like setting up your Google Analytics account and linking it to your Shopify Store or adding meta descriptions to your product pages to help them rank well, as all those boring posts you find by googling SEO for Shopify do, I WILL NOT WASTE YOUR TIME with SEO fundamentals that matter regardless of the platform your website is built on. However, no platform is perfect and Shopify too has some room for improvement in the SEO department. Without further ado, let’s dive right in and find out what they are and how you can overcome them. One of the best things about Shopify is that wide variety of themes that it offers. Shopify’s theme store offers a theme for every product, style and design aesthetic under the sun. Trouble is, with that much choice, it’s easy to confuse style over substance. A theme that’s built for your ecommerce platform loads faster, due to less conflicts with the other plugins or extensions or whatever those pesky add-ons are called. Google rewards fast loading sites with better rankings. Period. A Shopify theme ensures your site is mobile responsive. With Google’s mobile first index recently rolled out for most sites across the web, it’s imperative that your site’s layout and functionality suits mobile devices more than their desktop counterparts. Google makes that extra effort these days to crawl all your CSS and scripts, even if they’re not that perfect. Well, with a Shopify theme, your Shopify store need not worry about imperfections in CSS or scripts that act up. Convinced? Let’s move ahead. A good way to not lose your way when choosing your theme on Shopify, is to go with their handy “industry” filter and from there move on to design based options. Look for a theme that matches the spirit of your brand and has the ability to showcase your products without confusing the user. Navigation and user flow are critical aspects of user experience that impact both site conversions as well as SEO. So choose well. Do not go with a “the more, the merrier” mindset, when comparing themes based on the number of features they offer. Stick with features that you actually need, instead of cramming unnecessary bells and whistles into your site and slowing it down. Shopify allows you to test themes before you adopt them for good with a free trial period. Make use of this option by testing the SEO worthiness of your theme with a website testing tool like DareBoost. This nifty tool tells crawls through the theme and tells you all the various things that are right or wrong about it from an SEO perspective – Alt tags, security holes, CSS and more. Finally, as with buying anything else online, see what other buyers have to say about the themes you’ve shortlisted before making a commitment. Does your preferred theme have great reviews? From lots of users? Does it offer awesome support? Is it free or paid? Just some of the considerations to look at before embracing a theme for good. As an ecommerce site, the bulk of your website content will be in the form of product pages. However, optimizing product pages is notoriously hard if you use a template approach to web development. Shopify product pages are no different. To build an awesome store on Shopify, ditch the product descriptions you got from the manufacturer. Every competitor and his neighbor out there is probably using the very same product descriptions, page titles and images as you. Invest time and resources in crafting unique product descriptions that a human would like to read, not just something Googlebot would like to crawl. Of course, when you write those unique descriptions, don’t forget to use all possible variations of your most important keywords (branded and unbranded) strategically. Data shows that 92% of online shoppers read reviews before making a purchase. Google takes note of this fact and places a special focus on user generated content like product reviews, offering sites that comply with higher rankings. While product reviews don’t come “out of the box” in Shopify, you always have the option of downloading the free Shopify Reviews App. This app automatically adds the review into the page schema thus helping Googlebot easily spot the content as a product review and surface it at or near the top of its search rankings. Shine your spotlight on the centre stage of your product pages – your product images – by carefully optimizing them for your keywords that matter. While doing this manually for every single product, variant and image of each variant form various angles may be close to impossible, you can always lighten your load with a free Shopify app like SEO Image Optimizer. Besides adding alt tags to images automatically, the app manages the size of the image, keeping them light enough to load quickly, yet sharp enough to render well across screen sizes. Multiple product pages for the same product is a regular problem that most Shopify store owners face every day. Shopify tends to create different product pages for each variant of a given product. 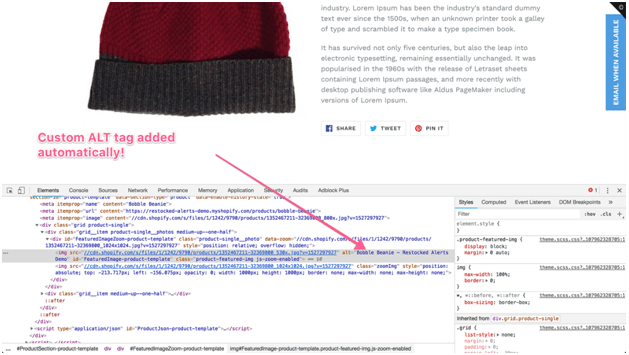 It also goes ahead and creates identical product pages each time your product gets tagged with a new attribute e.g. the same orange dress could be tagged under “Halloween Outfits” and “Fall Clothing” giving it two duplicate pages over and above the original product page. As we know, duplicate content is strictly penalized by Google and is a surefire way to lose SEO authority vis-à-vis your competition. Fix this duplicate content problem with the rel-“canonical” tag to tell Google which is your “original” product page and which ones are the duplicates that it can safely ignore. All you need to do is go into your Shopify Theme Editor and open the file called “theme.liquid”. Copy and paste the code below just before the end of the head tag, and you’re all set! What the above code does is simply canonicalize product URLs with “collections/” in them to their versions without. While I’ve focused the spotlight on three key Shopify-specific SEO issues, I’d be happy to hear from you about any SEO glitches you’ve seen on the Shopify platform and workarounds you’ve found for them. Tell us in the comments below; who knows, maybe we might be able to help you out!